Dissolve the starter with half of the water. Add flour, sugar and grated orange zest. Knead quickly and gradually add the remaining water. Knead on a wooden surface for about ten minutes, until the dough will be quite smooth and homogeneous. Add the salt and knead again for about then minutes. The dough should be smooth, elastic, well hydrated and soft. Add the butter cut into small pieces and knead again until it has been completely absorbed: it will be messy and sticky, use patience and a scraper, remove the butter from the working surface and add it back into the dough, until it will become smooth again, elastic and fragrant. It will take 15 to 20 minutes. Shape the dough into a ball, lay it in a bowl greased with some olive oil and cover with a damp cloth. Let it rise in a warm place, such as the oven with the little light on, until it doubles. Depending on the temperatures it might need up to 8 hours, as in my case. When the dough has doubled remove it from the bowl, flatten it lightly and a fold in two. Form a ball again, lay it into the bowl and let it rise covered with a damp cloth for an hour and a half, until it doubles again. Remove the dough from the bowl, roll it out gently in a 1,5 cm (0,6 inches) thickness and cut out many round circles with a 5 cm pastry ring. Let them rise covered with a tablecloth for an hour and a half. Now it's time to fry bomboloni in hot peanut oil: deep fry a couple of bomboloni per time, turning every 20-30 seconds, until they are golden. Lay them on a kitchen paper, then sprinkle them generously with sugar. Heat the milk with the cream and the seed scraped from the vanilla pod on low heat. When it starts simmering, remove it from the heat. In a saucepan, mix the sugar with the egg yolks and starches, then pour the milk gradually, stirring constantly. Put the saucepan back on low flame and stir continuously with a whisk until it thickens. Let it cool completely covered with a plastic wrap before using it to fill bomboloni. 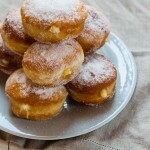 Fill the bomboloni with the Italian custard using a pastry bag. Dust them again with sugar and enjoy them for breakfast. You can even warm them lightly before enjoying your bomboloni.